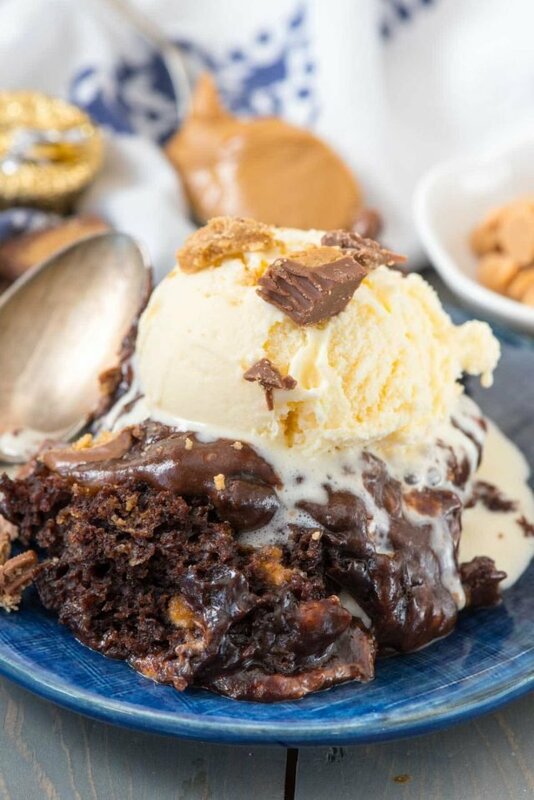 Slow Cooker Peanut Butter Brownie Pudding – chocolate brownie mix and pudding mix cooked in the crockpot with peanut butter and peanut butter cups! This easy indulgent dessert recipe is one everyone loves, including me. Right? And I’m trying to lose weight. Eating right is so hard when you have my job. SO SO FREAKING HARD. Monday: Okay. That’s it. Salad for lunch! Low-carb! Track calories! No wine! No dessert! Okay, maybe one cookie. I didn’t have wine, after all. Tuesday: Okay. TODAY IS THE DAY. Low-carb, no wine, track calories! no dessert. *Makes Peanut Butter Brownie Pudding* Okay, fine, veggies and pudding for lunch. No wine! Pudding for dinner. Wednesday: Okay. THIS IS IT. REALLY. Eggs for breakfast, no wine. Salad for lunch. Healthy dinner…Reese’s Peanut Butter Cups leftover from pudding recipe. Thursday: Okay. Really. No wine all week = #winning. Dramatic work and emotionally stressful morning ensues. Gryo for lunch. ALL THE WINE FOR DINNER. Although, to be fair to myself, I worked out all but one day last week and, did you see no wine for three days while I salivated while my husband drank a glass after dinner? Baby steps, my friends. Then I see photos of myself and I have to add money to the fat jar because even if I think it, not saying it doesn’t count. Maybe this week will be better. I guess that’s all I can hope for? Also, the moral of the story is don’t make Slow Cooker Peanut Butter Brownie Pudding when you’re trying to diet. Just don’t. Unless you like to torture yourself, or unless you’re going to a party and want to torture everyone else. This easy brownie pudding recipe is a riff on my original slow cooker brownie pudding. I love making desserts in the slow cooker, like caramel cake or apple crisp, or even pumpkin lava cake. They’re easy, fast, and feed a crowd. 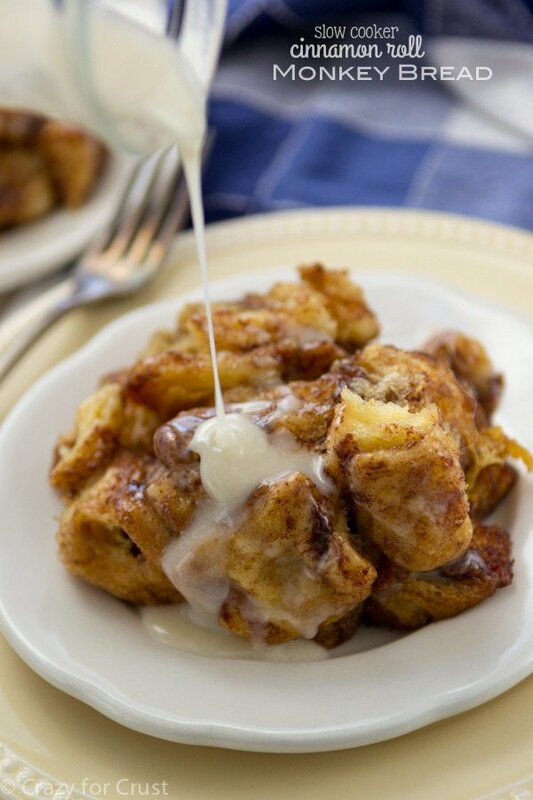 Plus, I think making them in the crock pot makes them even more ooey gooey than a normal cake or pudding cake recipe. If you haven’t tried crockpot pudding cake (or brownies) yet, you need to try. It’s such a versatile recipe because it starts with a mix. On this recipe you can start with a chocolate cake mix or a brownie mix. Both work and taste equally as good, and both really do taste like brownies. The difference between this and my original recipe is that I added peanut butter – lots of it! 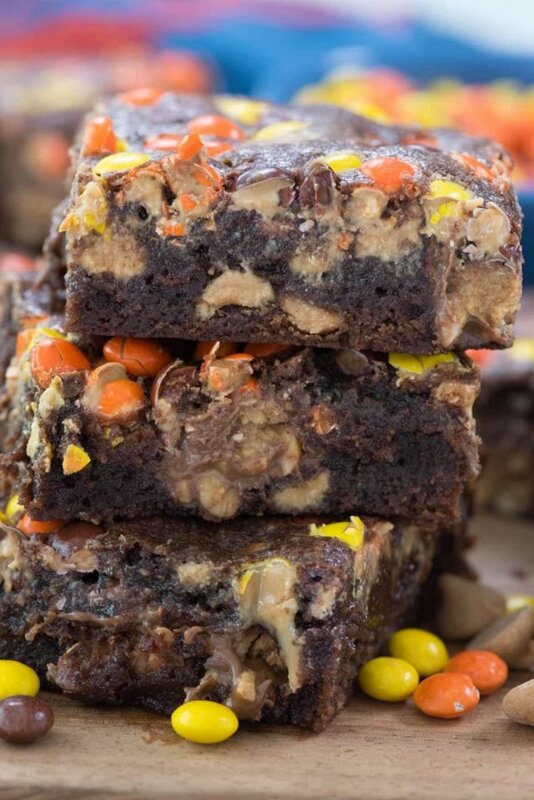 There are peanut butter chips in the brownie mix, melted peanut butter drizzled all over the cake, and peanut butter cups cooked right on top. 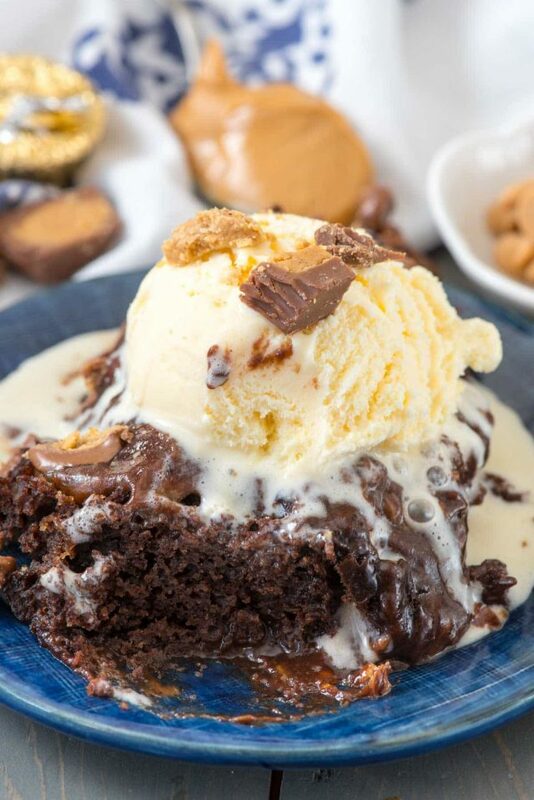 This brownie recipe makes it’s own hot fudge out of the pudding and if you like the peanut butter and chocolate combination, it’s the cake for you. 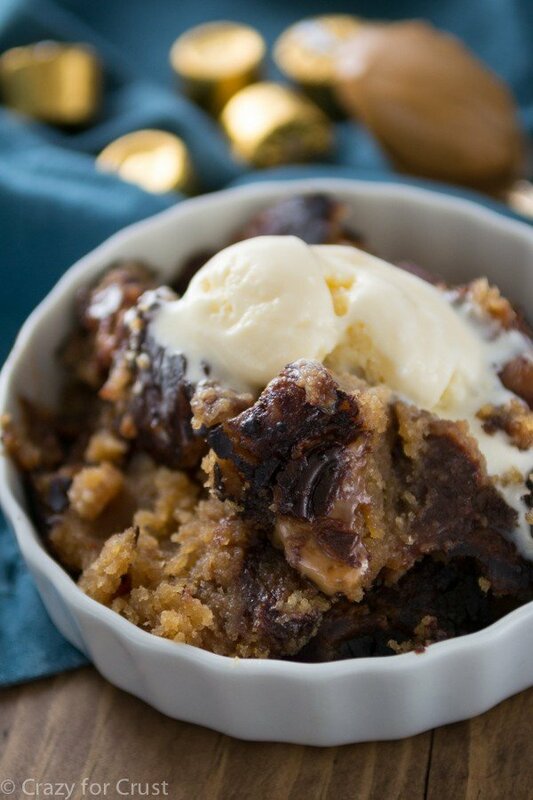 Slow Cooker Peanut Butter Brownie Pudding is a hot and gooey chocolate brownie recipe cooked in the crockpot. It makes it’s own hot fudge sauce and it full of triple the peanut butter flavor. You can use a chocolate cake mix or a brownie mix. If you’re using a brownie mix you can use 2 or 3 eggs (for fudgier vs. thicker brownies). All crockpots cook differently and at different temperatures. A new slow cooker will cook more even than an old one, etc. There is a range of cooking time from 1-2 hours for this recipe, but it could take longer if your cooker is lower in temperature. Just keep an eye on it after an hour and a half or so. The brownie will get done around the edges and it’ll still be runny in the center. That’s normal because of the pudding and peanut butter. Trust your instincts when checking; you don’t want the brownie to burn. It’s good hot straight from the crockpot but is also good later after it’s cooled and the gooey part has thickened. Ice cream is a must! 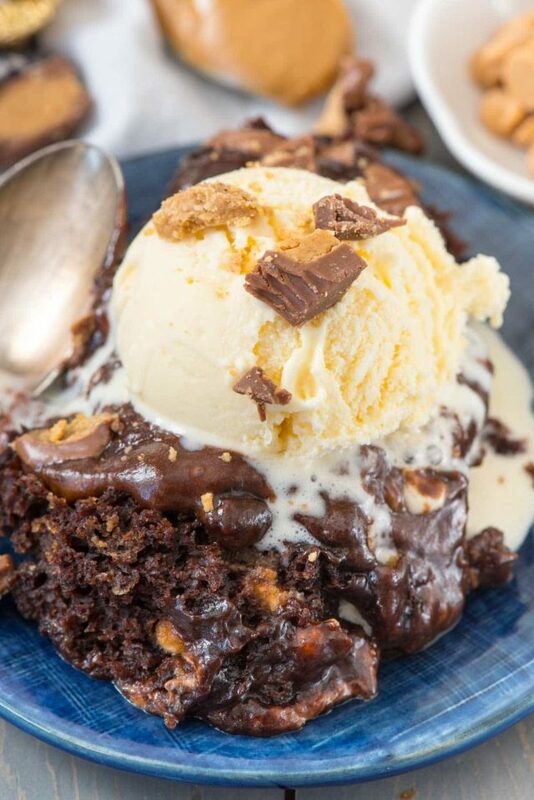 Slow Cooker Peanut Butter Brownie Pudding - chocolate brownie mix and pudding mix cooked in the crockpot with peanut butter and peanut butter cups! This easy indulgent dessert recipe is one everyone loves! Mix brownies according to package directions. Stir in 1 cup peanut butter chips to the batter. In a second bowl, whisk pudding mix and milk until smooth. Spray the bottom of a slow cooker liner with nonstick cooking spray. Pour the brownie mix in, then the pudding mix. Place peanut butter in a small bowl and microwave for 30 seconds, or until just pourable. Drizzle over pudding mix. Sprinkle with chopped peanut butter cups. Cover the liner with paper towels and then place the lid on top. Cook on high for 1-2 hours or until the edges look done. All crockpots cook this recipe at different times, depending on how fast it cooks. It will still be quite wet on top but the brownie part will be done around the edges. So many of my fellow bloggers love brownie pudding recipes too! Check out a from-scratch brownie pudding by Brown Eyed Baker, Brownie Pudding Toffee Trifle by My Gluten-Free Kitchen, and Hot Fudge Pudding Cake by A Family Feast. Don’t be so hard on yourself, Dorothy. I think you are pretty darn good right where you are. You are so much more than any number on a scale–I know that sounds cliche, but what you do everyday–bring a smile to so many people with your delicious creations–outweighs any negative thoughts you think of yourself. Be happy that your body has taken you this far and is healthy. Take care. I love this idea, but did not understand what this sentence was about. —->. “Cover the liner with paper towels and then place the lid on top.” Why would you put paper towels ? I don’t get it. Sorry. Yes, what does the cover liner with paper towels mean? uhh yeah there’s no way I could EVER resist this pudding!!!! SO rich and decadent! This looks so easy and decadent! I’m wondering if I can just make this in the oven. My slow cooker is massive and a beast to wash. I hardly use it! Popping it in the oven is a lot more convenient for me. Any ideas? Thanks!